I had a lot of fun on my cruise. A lot of fun. The entertainment, the excursions, the relaxation, the food, the drinks, all of it was exciting and thrilling. Yet, throughout it all, was this niggling feeling in the back of my head. A voice that grew louder and louder every time I clicked on my camera and flipped through the photos I took. I deleted picture after picture of me. Any full-body shots were deleted. Shots where I looked like I had 5 chins and my arms were the size of tree trunks were trashed. I rarely put on my bathing suit, wanting to stay in bigger tops that hid my belly. Sitting there on the deck of a monstrous cruise ship, lightly rocking as we sailed towards incredible destinations such as Jamaica and Key West and the Cayman Islands, all I could think about was how unhappy I was with my body. How unmotivated I had become to exercise, drink water, or eat a healthy diet. How my life began revolving around food. I was on a fantastic cruise, something I never dreamed I would have the opportunity to do, and because of the way I had let myself go, I couldn’t fully relax and enjoy it. I can stop making excuses and fully embrace living a healthy lifestyle. I can stop kidding around with my health and start eating more clean foods, less meats and sweets, and getting back into the mode of exercise I was in at the end of last year/beginning of this one. Pushing my body to its limits. Challenging myself. Cutting out soda, cutting down on my sugar intake, eating more fruits and veggies. It’s here where I will see my weight come off, my energy levels increase, and my happiness levels rise. But this path is a hard path. It’s tough and while I have a ton of people cheering me on from this path, it’s going to be a battle. Spoiler: I’m choosing the second path. Not only because I want to lose weight and be happy with the reflection that greets me in the mirror, but also because I need to be healthy. Choosing the first path may seem easier now, but it will slap me in the face with obesity and medical problems down the road. I have to stop playing around. I have to stop half-assing my attempts at losing weight and living a healthy lifestyle. I know it can be done. I know I can do it, because I’ve done it before. And nothing helps me better than accountability. Especially accountability on my blog. I have been debating whether to post updates on my healthy living goals or to just stay mum and do it on my own. But I know my chances of success are vastly greater when I share it, when I get advice and support and feedback. Remaining quiet about my struggles and goals helps no one, most especially me. I’m a writer and I am perfectly okay with sharing my struggles, being vulnerable, and asking for advice on my blog. So I am. Weigh-In: I will not be posting my weight here. I’ve done that enough and trust me, the scale wasn’t pretty to face this morning. But I did it. It’s a number I have never seen on the scale. And it’s time to see that number drop. I will say I am aiming to lose 45 pounds. It will be slow. It will not happen over the next 6 months. It took my mom over 2 years to lose 80 pounds, and I have a little more than half that to lose. But I can do this. Next week, you’ll get to find out whether I lost or gained weight, as I’ll only be posting how much I’ve gained or lost. Exercise Completed: Does zip-lining count? Climbing up and down all the stairs on the cruise ship? Putt-putt golfing in the rain? That’s been the extent of my exercise this week. Sigh. I’m planning for a much better update next week. Splurge/Guilty Pleasure: Hm. Two warm chocolate melting cakes, one apple pie, five six seven fruity drinks, enough pieces of chocolate to last me for the month of July… it’s been a week of splurges, to say the least. Success Story: I’m back at Weight Watchers. It’s been a while. And it’s good to be back. Recipe(s): Considering I’ve been subsisting on cruise cuisine and fast food for the past few weeks… yeah. I can’t remember the last time I made a recipe. If you feel like joining us, hop on over to Lauren’s blog to link up. As a quick note, the term “cardboard box diet” comes from the idea of all of us who have that cardboard box in our closet of clothes that are too small to fit us. That cardboard box is fueling us to live a healthier lifestyle and find that girl who was thin and fit once again. It’s not a diet program. For more info on this, you can find out here. Good luck! I really loved WW so hope you have a good experience now that you are back on the program. The whole weight loss/healthy living journey is definitely something that you have to do on your own terms when you are ready – and it sounds like you are ready! I do think it gets easier as it goes, and it helps that your mom has been there and done it and can help guide you along the way! You can do it – just don’t stop believing in yourself! Hoping this time is the charm! I’m going about it differently, understand what has tripped me up in the past and what I need to do now. I’m just going to take each day as it comes and not get too far ahead of myself. I know I can do it, because I lost 25 lbs back in 2008, so now I just need to stop making excuses and GO FOR IT. Good luck! Don’t give up! Um, you did a far better job explaining this! Thanks for joining and I’m excited to see where this takes us in the coming months. WE CAN DO THIS. YOU CAN DO THIS. THANK YOU for starting this! I think it’s exactly what I need to focus myself back on eating healthier and exercising more. I’m really excited to see this take off! I feel your camera angst. I’ve been married for five years and we have – wait for it – one photo together outside of the wedding pictures. I don’t mean professionally taken. I mean ONE photo together. That’s how much I hate the camera. And it dawned on me that, looking around, people would stare at our walls and think my husband is really vain, since they’re just pictures I’ve taken of him LOL. I’m doing the same. Overall, I aim to lose 80 pounds (65 left). It sounds horrifying, but it’s what I put on and I’ll do my best to take them off for my health – but I plan to just put the “how much lost” versus the THIS IS WHAT I WEIGH, JUDGE ME. LOL. Also, kudos on the WW! I rejoined back in late March as well, and it really does feel GOOD to be back. Camera angst. It’s terrible. I have these beautiful photos in exciting locales yet I DELETE THE PICTURES because I hate the way I look. It’s time for a change. No more playing around. One thing I have totally learned from all my mistakes is that I can exercise as much as I want but if I’m not eating right? It’s not going to show any results. Sure, I may not pack on the pounds as easily but losing weight is more about how you eat than how much you exercise. I wish I was better at eating healthy than exercising, sometimes! It would make this journey SO much easier. I’ve spent the past few weeks trying to figure out what I’ve done wrong in the past (like my sugar-free diet. It was a good idea in theory but made me go CRAZY when I finished it) and how to remedy it. Things like eating at home more, finding healthy snacks that I like not the ones that are “popular” now, and realizing I don’t have to give up my favorite foods, I just need to eat them in moderation. It’s a battle, but I’ve lost the weight before and all it took was a lot of determination and motivation. I think I have that same mentality now so I’m hoping this time I can stick with it for the long run! It’s true – it’s all about choices. Good or bad, we make them for ourselves 🙂 so let’s all make some good ones together! Back in April, I switched over to self-hosted WordPress so my .blogspot feed won’t update anymore. I have definitely fallen off the workout train, and I really miss it. A good workout is such a good feeling. But my schedule is so crazy right now that it’s been hard to consistent. I had a similar experience in Paris. I think that sometimes it’s easier to take stock of life when we’re out of our normal routine. I know you can do it, and I’m definitely rooting for you! Good luck. Sometimes it’s hard when you go on vacation, and you have been on two recently. Every time I do that, it’s hard to get back into eating healthy and exercising, so you just had a vacation – lull – vacation… don’t beat yourself up about it! 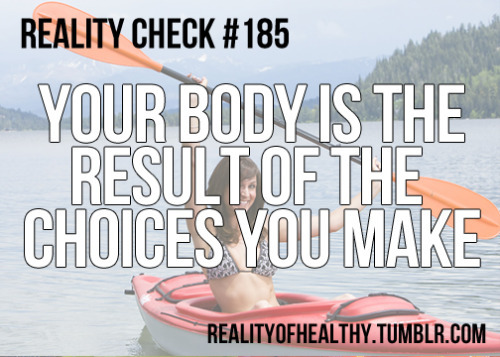 Like your quote says, just try to make the choices and your body will show results accordingly! Visiting from LFG I just linked up a bit late. Story of my life 🙂 I’m starting back to Weight Watchers tomorrow!